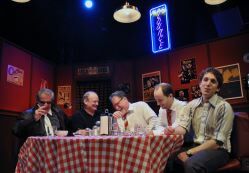 The jazzmen of Warren Leight’s 1999 Tony-winning play, Side Man, have come to see themselves as the last, dying remnant of a music to which their lives have been passionately, even obsessively, committed. Gene Glimmer, who has played with the likes of Benny Goodman and Frank Sinatra, is reduced, once rock has replaced jazz as the leading popular music, to playing for a Lawrence Welk-like band and finally to gigs in a nearly empty bar. Gene is fully alive only when playing his trumpet, and he is terminally clueless and emotionally disconnected from the people around him. 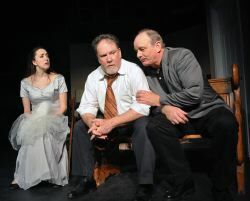 John Coscia plays Gene with a shambling physicality and quiet, almost unvarying voice that convey his lifelong disengagement, seemingly his only defense against a world with which he cannot cope. 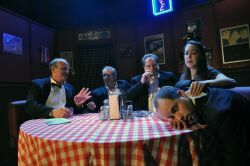 There is little difference in affect, in Coscia’s characterization, between having difficulty in finding a parking space and witnessing the disintegration of his wife, Terry. Probably only someone with Gene’s well-honed talent for obliviousness could stand being in the same house with Terry for more than a day. As played by Andra Whitt, Terry begins as a foul-mouthed but remarkably naïve young woman who evolves into a screaming harridan with a tenuous grip on sanity even when she is sober, which occurs less and less frequently as she ages. Whitt plays the role with a rasping voice and mysterious accent that emphasize how hard Terry is to bear. Her physicality embodies Terry’s brittleness and deterioration. 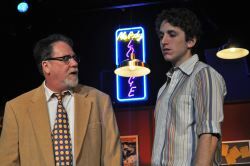 Ari Post plays Clifford, the Glimmers’ son, a Tom Wingfield-like figure who narrates the play and comments on its characters, and who ultimately needs to leave family behind to find his own way. From the time he was a child, Clifford has had to be the responsible adult in the house, taking care of his hapless parents. The grown Clifford looks at the world and his parents with wry detachment, being “fine” – as he has always had to be in the chaos around him – but not finding a way to be happy. From the top of the show, in which Clifford haltingly gestures a number of times before be begins telling his story (a fine choice concerning a character whose journey is about finding his own voice), Post displays a nice sense of timing in his character’s lines and reactions. The supporting trio of Al (David James), Ziggy (Craig Geffrion), and Jonesy (Bobby Welsh), as befits jazz players, have a strong ensemble among themselves and with Gene. It is clear from the interaction of this quartet of friends and colleagues that their decades-long relationship is the only real human contact any of them have, wives and families being peripheral. Only other players know the joy and frustrations they share, and there is genuine safety and support and companionship among them. 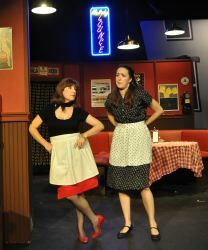 Christina Thronson, as Patsy, an oft-married waitress in the lounge where the four frequently gather and play, adds a welcome note of warmth and compassion to the proceedings. The well-designed and executed set is divided into playing areas representing the lounge (including a colorful neon sign) and the Glimmers’ apartment, with moveable set pieces used to represent the musicians’ locker room, a police station, etc. 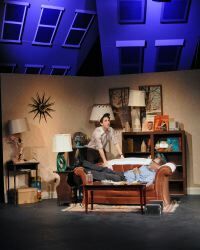 Large gray representations of apartment buildings, in angular perspective, loom over rest of the set, helping to establish the play’s emotional tone. Particularly in the more episodic second act, there are some slow scene transitions as flats and set dressings are moved on and off the stage. 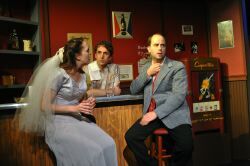 At times, the lighting transitions between scenes in different areas of the stage are incomplete or late, leaving actors (especially Post) in cold spots. There is a nice effect of a trumpeter silhouetted against a framed scrim to close the show. Given that this is a show about people who play jazz, the sound design is important. Fortunately, the musical selections are well-chosen, though they sometimes sound a bit too good. For example, a key moment in the show comes when the jazzmen listen on a portable tape player to a bootleg cassette, dubbed from an old wire recording, of a famous trumpeter’s last performance. The sound over the theater speakers is substantially more hi-fi than the likely scratchy, thin sound one would hear in these circumstances. I wish the characters in this scene had been given more time to linger over the sound they love, so that the audience could better absorb their moment of bliss. One of the many delights of listening to WAMU’s “Hot Jazz Saturday Night” is Rob Bamberger’s encyclopedic knowledge of the artists on records from the 1920s-1950s era of jazz and big band performance. He gives due credit, by name, not just to the stars but to the many ensemble players who supported them. At least for three hours every Saturday, the real-life equivalents of Gene, Al, Ziggy, and Jonesy are not forgotten men, and their music is not forgotten music. There are far more points to make and people to thank here than I will have time for, so I will just jot down a couple of thoughts to share with you as you join us at the James Lee Center. We decided to highlight as much as possible the story of Jazz, brought to life by the people who live the art form – an often peculiar brand of living as it were. Al and Patsy, Ziggy, Jonesy, the Glimmers, they all found their home in Jazz and lived hard, passionate lives through it. Something special drew these people in and kept them in. That’s what Clifford wants to leave the audience with, wants to leave you with in the end. Jazz as an art form went from popular clubs and ballrooms to the nooks and crannies of America in a matter of decades. I am indebted to many people in this production, but I have the play itself to thank for uncovering a new love of my own in the music. 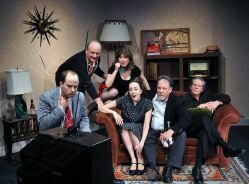 This was my first go-around directing a full length play, and the experience has been more than rewarding, because not only did I get to work with a talented cast and driven technical crew – I got to work closely with friends and family. We had a chance to bond, thinking through this play. That meant a lot to me. To my cast: the show is yours. Have fun out there. This article can be linked to as: http://showbizradio.com/go/8103.